The rain deluge began in Los Angeles on January 14th, and poured onto the LA region for four days straight. But the real storm was the strike of 33,000 members of United Teachers Los Angeles (UTLA) against the Los Angeles Unified School District (LAUSD), the second largest school district in the country. LAUSD has more than 645,000 students, ninety percent of whom are of color, and eighty percent of whom live at the poverty level. 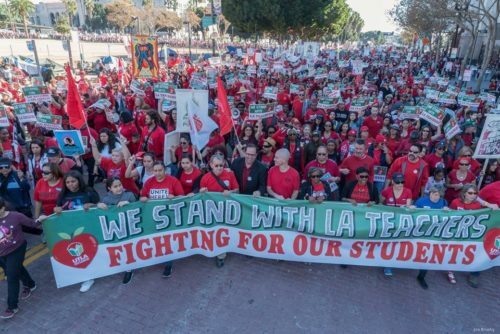 The picket lines for the 30,000 members of UTLA went up at almost 900 schools stretching throughout the City of Los Angeles and twenty- five adjacent cities. The strike was called by the union after twenty-one months of negotiations, during which billionaire-backed charter school advocates won a majority on the seven-member school board and after that majority hired a multi-millionaire venture capitalist with no educational experience, Austin Beutner, as Superintendent. The strike might have happened in October of last year, but Beutner was able to use a number of technical and legal maneuvers to prevent it until January. Beutner and the charter majority on the school board calculated that the delay would cause UTLA to lose momentum and tried to create doubts among their membership and the parents about whether they could win, and whether a strike was the right thing to do for kids. The torrential rains that began on the day of the strike probably encouraged Beutner and his cronies to believe that the heavens were on their side — that the downpour would discourage participation on the picket lines. Were they in for a surprise! When the sun was supposed to rise on January 14th, the picket lines at every school were long, strong, and militant. Teachers dressed in Red for Ed walked the lines, and they were joined by thousands and thousands of parents, members of other unions, students and former students — all chanting, singing, dancing, pounding drums, blowing whistles and truly enjoying a “festival of the oppressed”! Every picket line and march shouted out “Who’s Schools, Our Schools!’, “Billionaires Can’t Run Our Schools!”, “Less Testing, More Teaching!”, and the resonant “UT — LA!”. The first morning of picket lines was followed by a rally of more than 60,000 people, who marched under umbrellas through the deluge from City Hall to the District office, accompanied by a steady sound of drivers horns as the city honked in solidarity with the strikers. 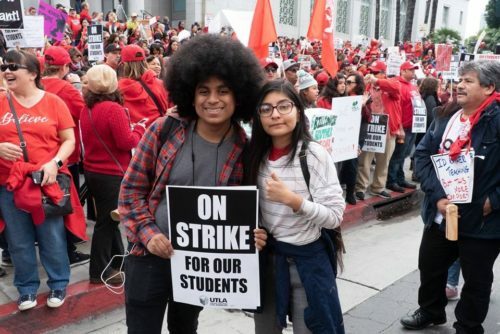 For the entire strike at every picket line, throughout the marches and at the rallies, the themes were consistent — UTLA demanded that the district lower its class sizes, and fully staff schools with nurses, counselors, and librarians to meet the needs of their students. The leadership of the union, with president Alex Caputo-Pearl in the forefront, said that they were “bargaining for the common good” and to defend and improve public education against the billionaire privatizers who wanted to convert the district into a system of charter schools. No union chant, no union speech, no union flyer focused on the issue of salary increase, although the union was demanding a 6.5% increase. Salary was clearly not their priority issue. The priority was educating the public that in a state with the fifth largest economy in the world, a state with more billionaires than any other state in the US, a state with an extensive prison-industrial complex, California is 43rd in per pupil spending, and class sizes often reach 40 or more students. The union also pointed out how the growth of charter schools (publicly funded but privately managed schools) in the district drained $600 million per year from the district budget, leaving the public system even more underfunded and under-resourced. The public response to the strike was amazing. Despite the flood-like rains, the picket lines actually got longer and stronger every day of the strike. At one mostly Latin@ school in Southeast Los Angeles, the teachers and parents on the picket line were joined by a contingent of more than 100 students who had made their own banners and signs to support the teachers. Leaders and rank-and-file members from UNITE-HERE, SAG-AFTRA, IATSE, the United Food and Commercial Workers, Musicians union, AFT, Writers Guild, SEIU, the IAFF (firefighters) and more walked the line with the teachers. 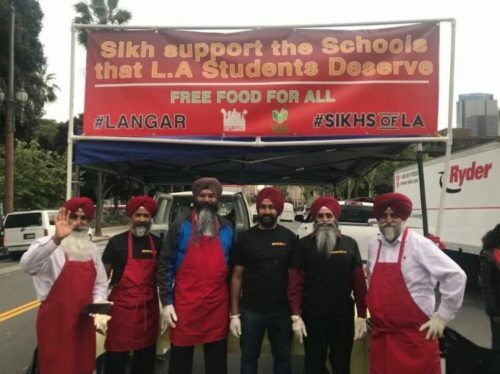 Over 200 schools were “adopted” by the LA County Federation of Labor unions as their members joined the lines in their communities. The California State Labor Federation also supported the strike, as did the California Teachers Association, the California Federation of Teachers, the American Federal of Teachers, and the National Education Association. Local unions also contributed money and food not only for the strikers but also for school communities that provided food for students who were unable to get their school meals. The firefighters were really fired up! They brought their own fire truck to the offices of the LA County Fed and had teachers and parents hop onto the vehicle which they then drove with siren wailing, lights flashing, and horns blowing at full blast to the picket lines of four nearby schools that the Fed had adopted. That drive itself illustrated the larger issue that UTLA was raising — the horrendous and systemic class and racial inequality that exists in our society. As the firetruck rolled through the streets, people nearby would shout and wave, and raise their fists, including residents of the extensive homeless communities that exist in Los Angeles. The richest country in the world, and the richest state in the country, has one of the most underfunded public education system in the US, and the worst homeless crisis in the country as well. California’s investments for communities of color can be found in the nearly two dozen prisons that crisscross the state, in the drones, armored cars, and helicopters that are owned by every urban police force in California. UTLA literature pointed out that the state invests $26,000 per year for each incarcerated prisoner, but barely $13,000 per year for each of our public school students. After four days of growing pickets and increasing public support, a poll by Loyola Marymount University showing 80% support for the strike — the politicians came out of hiding. On the final day of the strike, more than 1000 firefighters, in town for a national conference, marched behind their fire truck in support of the teachers. LA Mayor Eric Garcetti after remaining silent for days, issued a statement of support for the issues being raised by UTLA, as did newly elected Governor Gavin Newsom. Garcetti offered to mediate after negotiations had again proved fruitless, and after a 21-hour marathon bargaining session, an agreement was reached, one that was an overwhelming victory for UTLA. The union negotiating team, led by UTLA secretary Arlene Inouye, heard the chants of 60,000 supporters outside city hall as they negotiated with Beutner and district lawyers and top brass. “Many of the issues that we bargained had been put across the table before but the difference this time was the 65,000 voices outside in the park at City Hall and the strong picket lines at 900 school sites, “ says Inouye. In the end, the union contract contained 24 major provisions, including a beginning of class size reduction, the elimination of a policy that allowed the district to ignore class size restrictions whenever they declared that they had a “financial emergency”, a massive expansion of nurses, counselors, and librarians, a process to reduce student testing by up to 50%, support for ethnic studies, creation or expansion of green spaces at school facilities, and shared decision-making at 30 community schools in the highest needs neighborhoods, as well as the creation of district support for immigrants and their families. The teachers secured a commitment from Superintendent Beutner to support a resolution at the LA Board of Education calling for a state cap on charter schools and a joint commitment to work together to increase funding to schools.T hey also achieved their 6% raise. The contract was approved by 81% of UTLA members, and by the LAUSD Board of Education. This victory is a model for other teacher unions and for the larger labor movement. The leadership of UTLA had worked for years to build up the organized strength of their rank-and-file, and to build strong partnerships with mass organizations in communities of color. This leadership well understood the trend towards the privatization of public education and recognized that their only path to victory was through social justice unionism, a unionism built on a strong commitment to social justice, understanding that racial and class inequality follow all of their students into the classroom and is the reality of their families and communities. UTLA received strong support from LA Black Livers Matter! because the teachers’ union had been strong supporters of that movement, and of the student demand to end the “wanding” by school security of mostly Black students. In 2017, the union organized a Shield Campaign at 400 school sites, in which teachers carried signs shielding their students against sexism, racism, and the repression of immigrants. This support was reciprocated during the strike with strong support from the immigrants’ rights community, with organizations like CHIRLA (Coalition for Humane Immigrant Rights in Los Angeles) at the forefront. But most importantly, it inspired support from tens of thousands of Black, Brown, Asian, and white parents and students. The first rally of 60,000 people was followed by a second rally of more than 60,000, and a final rally of 70,000 people — all while the rain came down in buckets. The strike also received strong support from Chican@ and Labor icon Dolores Huerta, a founder of the United Farm Workers Union, and entertainment celebrities like Little Steven Van Zandt, Tom Morello and Rage Against the Machine, Melissa Etheridge, the band Ozomatli, and actors Marlee Maitin, Alyssa Milano, Benjamin Bratt, Sean Astiin, John C. Reilly, David Arquette, Richard Dreyfus, and others. When Bill Maher had introduced Alex Caputo-Pearl at his show “Bill Maher Live,” the president of the teachers’ union received a raucous and prolonged standing ovation. The billionaires who have been trying to take over LAUSD are led by mega-developer Eli Broad, but also include the Walton Foundation (Walmart fortune), Reid Hastings, conservative CEO of Netflix, John Arnold former Enron executive, and former LA Mayor Richard Riordan who is infamous for helping the Catholic Diocese of Los Angeles to break a strike of groundskeepers at Catholic cemeteries, and the California Charter School Association, whose “dark money” spending at the California State legislature tops that of big Oil, and big Pharma. The Los Angeles Times, which has been a mouthpiece for Broad as a “philanthropist”, leaked a document from Broad that indicated that he intended to invest $500 million into an effort to convert more than half of the District’s schools into charters. When this scheme was exposed, Broad had to backtrack and proclaim that the money would be used to improve the “entire educational system” in Los Angeles. The union leadership, whose Union Power caucus slate had won almost every seat on the Board of Directors in 2014, had recognized the privatization threat and worked to build the strength of their union. In 2016, more than 83% of UTLA members voted to increase their dues significantly so that they could strengthen and expand their community organizing, research, and communications staff. 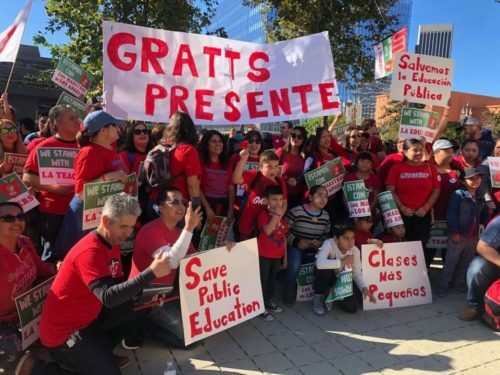 UTLA organizers not only worked to organize the teachers at LAUSD charter schools but also to reach out to communities of color to listen to their concerns and demands for improving LA’s schools. Union leaders each visited more than 50 schools to engage with their membership, and to build the leadership of each school’s chapter chair. Public education has long been an arena of intense racial and class struggle in the United States. Especially for oppressed people of color, education is seen as the most important vehicle to try and achieve economic and political equality in a viciously racist society. Fights for integrated schools, for bilingual and multicultural education, for ethnic studies, for the hiring of Black, Brown, and Asian teachers and counselors, for community control of schools — have involved millions of oppressed people of color and working class people. For the US ruling class, public education is a vehicle for preparing and a work force and young people to fight their wars, but even more importantly for socializing students to accept the capitalist status quo. This is one important reason why the Los Angeles teachers strike is so important. The union called out capitalism, called out racial inequality, and offered a vision for education that is liberatory, just, and democratic. And this is also a reason why they faced such powerful opposition, from billionaires, politicians, the mainstream media, and even some community organizations that have sold their souls to the charter school privatizers. And it is also why they won such broad public support. The Los Angeles teachers strike is already having a major impact on the fight for educational justice. On January 29th, the LAUSD Board of Education by a 5-1 vote passed a resolution calling for a cap on charter school expansion, despite the fact that the charter schools bussed in more than 1000 people to oppose the resolution. In Northern California, Oakland teachers staged a one-day wildcat and are gearing up for their own strike for smaller class sizes and expanded funding. The California Action Coalition of Schools (CACS) is organizing and uniting teacher unions from several large urban school districts to advance the struggle for increased education funding and genuine school reform. The strike will undoubtedly too have an impact in other states, just as the strike of Chicago teachers influence UTLA, and striking teachers in Arkansas, Oklahoma, West Virginia, and Arizona. Teachers in Denver, Colorado voted on January 22nd by 98% to strike.